Julie lives in North Texas with her husband who loves her, her dog who adores her, and her cat who tolerates her. When she's not writing or trying to catch stray cats, she works at an academic library.Side Effects May Vary is Julie's debut novel. It's a little unreal how much I want to read this book. I love the idea of a girl being fearless and then having to face the consequences. I met Julie at a convention in September and she is so kind and adorable, and I can't wait to read this book! I want to know how she faces the consequences. Thanks for the chance to win! Cancer books have always interested me and I LOVE the cover! Plus, I've heard that the main character took ballet classes like I do so I am doubly excited to read the book! :) Thanks for the giveaway! :D Also, Harvey (the love interest) sounds really sweet. 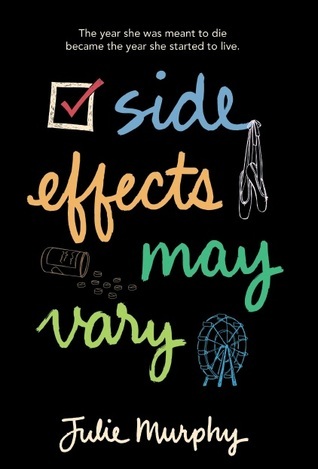 I'm looking forward to reading Side Effects May Vary. The synopsis looks like a interesting take on a cancer book.